Rediff Shop & Gift > Toys & Games > Learning and Educational Toys > Educational Toys > Kuhu Creations Explorer Toy Retro Rudder Steam Power Boat, Runs On Candle, Fuel Flame. Kuhu Creations Explorer Toy Retro Rudder Steam Power Boat, Runs On Candle, Fuel Flame. Kuhu Creations Explorer Toy Retro Rudder Steam Power Boat, Runs on candle, Fuel flame. Description: Scientific Water Toys Steamer, Early Edge Education Toy, Tin Boat - Lenth 16 cm, Width 12 cm, Height 5 cm (approx). 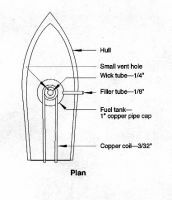 Function: candle flame to generate steam which moves the boat rapidly in water with a putt putt sound . The steam chamber needs to be primed before introducing heat.This pushes the water out of the tubes. The reaction pushes the boat forward. As the steam continues to expand, it encounters the section of tubing that used to be full of water and the steam condenses back into water. This causes a vacuum to form, which pulls more water back into the tubes. You would expect that the water moving back into the tubing would cause the boat to go backwards. 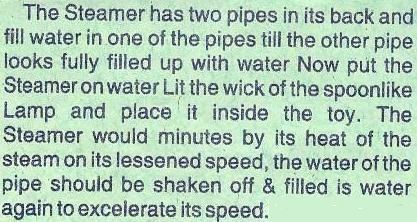 However, the water doesn't get very far before it hits the end of the tube (the two streams of water in the two tubes meet each other in the coil). 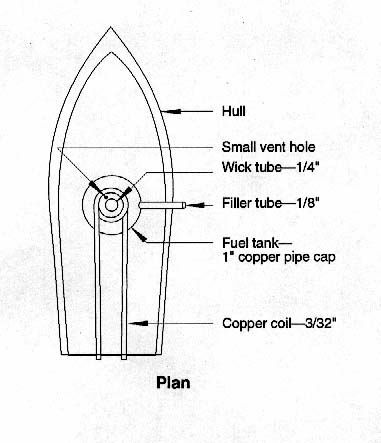 Any motion caused by the water being sucked into the tubes is reversed by the water hitting the front of the tube (the coil) and pushing the boat forward again. As you saw when you put your finger near the tubes, this back and forth water motion is fairly rapid, and the comparatively heavy boat never actually moves backwards at all. These are made in India on hand-operated presses, from tin plated steel. hand-painted. They make a wonderfully loud "putt-putt-putt" sound as the steam around a bathtub,swimming pool or pond. You can (http://sci-toys.com/scitoys/scitoys/thermo/poppop6.avi) to see a video (with sound) of the little boat speeding around a bathtub. 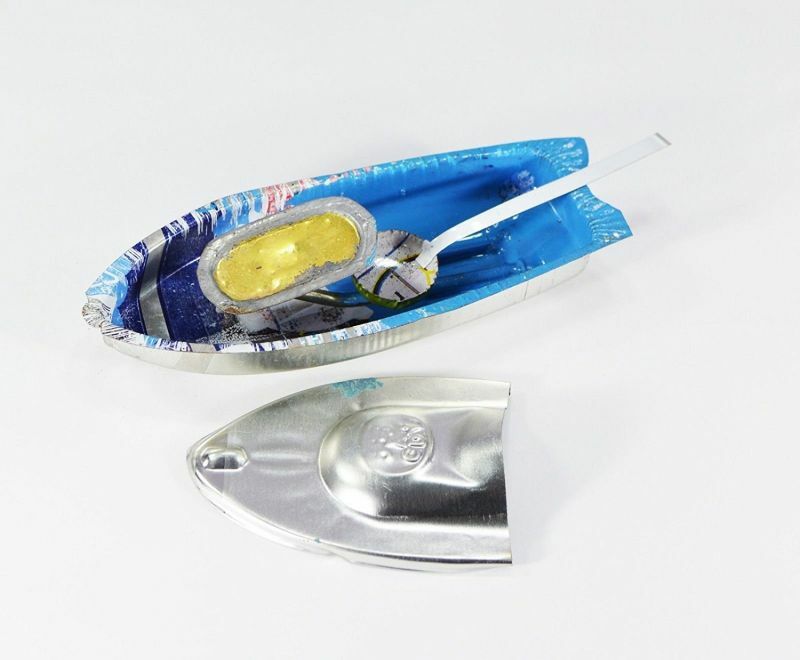 Please Note: Product batch being different so the colors & pattern may have a little difference from Pics Shown, Kindly Note- This Toy Boat is made from recycled Tin materiel with rough finishing (not fine finishing) Please remember this fact before order. Please insure parents/adult supervision while kids playing. Shipment Details: 1 Steam Toy Boat (with fuel spoon only). 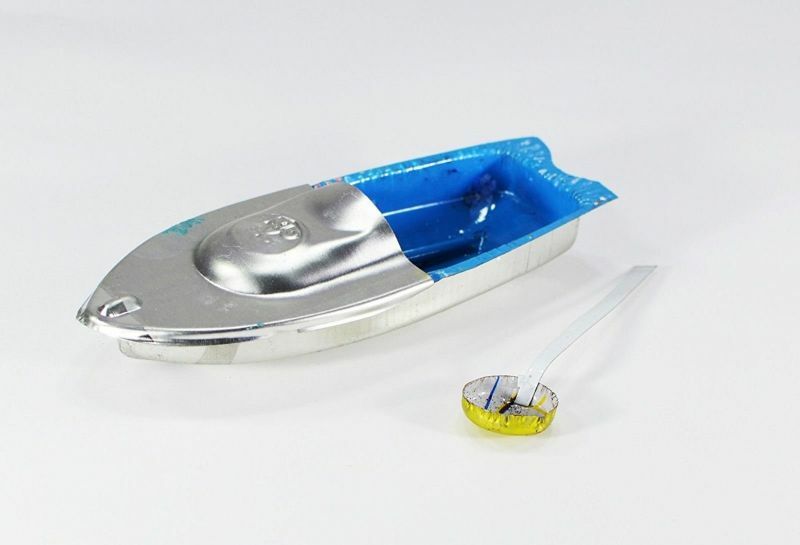 1 Steam Toy Boat (with fuel spoon only).